Alabama has dominated the SEC for the past three years, winning three straight conference championships and representing the conference in the College Football Playoff in each of its three years of existence. It should come as no surprise that Nick Saban’s squad is expected to continue their dominance in 2017. The Tide are coming off a difficult National Championship defeat to Clemson, but should not have a problem returning to the Natty this year. They’re returning nearly every offensive starter, including three potential Heisman candidates. Their expectations are so high in fact, that 5Dimes has released some preseason odds that have never existed for a college football team. 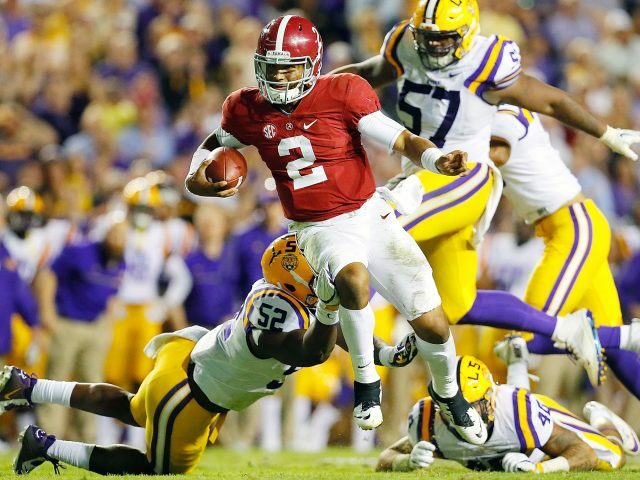 Bama is +2000 to win each game this season by 10+ points, and +2000 to go undefeated in both of the next two seasons. You can see all of their ridiculous props here. As for the rest of the conference, it’s essentially a battle for second according to oddsmakers. Behind Alabama’s -153 conference odds (the only team in the country with minus odds), Auburn (+685) has been given the best shot, followed by LSU at +800. Interestingly, all three mentioned teams are in the SEC West. Obviously, the West has been the superior division in recent history, but in general, when a conference has such a juggernaut as Bama, the next team or two in terms of conference odds tends to come from the other division (see Wisconsin in the Big Ten, Washington in the Pac-12). The reason being that the winner of each division gets to play for the championship, so it’s more doable to win one game vs. the juggernaut than to outperform them for an entire season. For those now thinking that there’s inherently some value on an SEC East team like Florida or Georgia (both at +1000), I should warn you that even after Florida won the East last year (with +1500 preseason odds to win the SEC), the closing line of the SEC Championship was +1100/-2100. Back to the West. After bringing in quarterback Jarrett Stidham (sophomore transfer from Baylor), Auburn is potentially strong enough to compete with any team in the country, including Alabama (the Tigers will be hosting the Iron Bowl this year). They’ll be returning 15 starters, including running back Kamryn Pettway, and have a defense that allowed the fifth fewest points per game in 2016 (15.6). The question mark therefore is on Stidham, and with a week 2 matchup at Clemson, it won’t take long to get an idea of what kind of team this is going to be in 2017. LSU is another team with high expectations heading into 2017. They’ve got plenty talent at running back despite losing Leonard Fournette to the NFL Draft. Derrius Guice was extremely impressive in 2016 averaging 7.6 yards per carry, and figures to be in the Heisman conversation this season. The defense was just behind Auburn’s in 2016, allowing 16.4 points per game, sixth in the country. Unfortunately, they’re losing half their starters, and have road matchups with Alabama, Florida, and Tennessee. It would surprise me to see them ultimately making a run at a conference championship, but it is college football. Crazier things have happened. As mentioned, Florida and Georgia both have +1000 odds to win the conference. Georgia’s struggling offense will benefit from the healthy return of running back Nick Chubb, but there’s still questions at receiver and offensive line. QB Jacob Eason is entering his second year as starter, which is usually a sign for overall team improvement, and their 16th ranked defense is retunrning 10 starters. Last year’s East champs, the Gators, are still waiting on a starting quarterback to emerge from their ongoing QB battle. Earlier this offseason it looked as if Notre Dame transfer Malik Zaire was going to be their guy, but redshirt freshman Felipe Franks has made his own case, leaving head coach Jim McElwain still up in the air on a decision. If you’re looking to take one of these teams to win the SEC, I’d take a lesson from last year and wait to see how things play out. As we saw in 2016, there isn’t much value gained from placing a preseason bet on an East team to take the conference from Bama. Alabama and Auburn aside, it was a tough year for spread bettors in the SEC. Ten of the 14 teams in the conference ended the season with below .500 ATS records. The SEC’s reputation likely drew more casual bettors to their teams, and created value on the opposing side. In fact, simply fading SEC teams on the moneyline rewarded bettors with 13.6 units in 2016-17. As for Kentucky, however, moneyline bettors saw the balance on their betting accounts skyrocket, thanks in large part to a huge road upset at Louisville (closed over +1700), as well as big wins at Missouri and vs. Mississippt State. The Wildcats were the most profitable moneyline team in the Power 5, ending the year up 18.5 units. As we’ve seen with some of the other dominant teams of 2016 (Clemson and Ohio State), there’s little to no value betting a team like Alabama on the moneyline. Despite an undefeated regular season, the Tide rewarded their moneyline bettors with only 1.6 units on the season, meaning just one loss would’ve put them in the red. Alabama running backs are no stranger to Heisman trophies, with Mark Ingram and Derrick Henry taking home the award in 2009 and 2015, respectively. Perhaps that’s a sign of the strength of the Bama running system, which would lead us to look no further than Bo Scarbrough at +1400. I’m personally not a fan of preseason Heisman betting, as we’ve often seen the winner come out of nowhere once the season starts, but I’m surprised that more bettors have not bet on Scarbrough based on the above logic and driven his odds closer to +1000. Of course there’s still a few weeks to go before the start of the season, so maybe we’ll start to see some movement. Getting ready to bet on college football games? Try our pro membership, with which you will receive best bet picks for all major sports, bet signals, public betting and dollar percentages, and more. Follow us on Twitter @SportsInsights to make sure you are up to date on blog posts, injuries, and sports betting information.